Mark September 30th on your calendars! 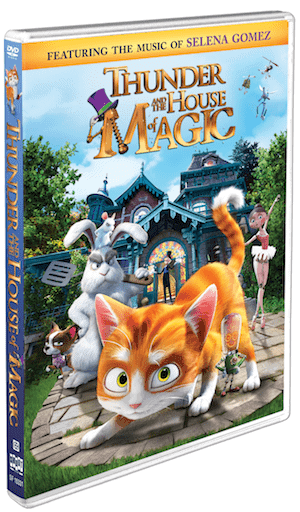 That is the day you can purchase Thunder and the House of Magic on DVD and 3D Blu-ray exclusively at Walmart! It looks like a movie that my daughter would enjoy. If you can’t wait to buy it, you can check it now on VOD. Thunder and the House of Magic is a whimsical animated family adventure, bringing to life a unique story with a great sense of humor, positive values and universal appeal. Brimming with spectacular animation and endearing characters, this internationally acclaimed motion picture delivers a fun and captivating movie experience for the entire family. The film tells the story of Thunder, an abandoned young cat who stumbles into a magical old mansion operated by a dazzling array of automatons and gizmos. Owned by a retired magician, the house is occupied by an assortment of his wacky assistants who don’t all welcome the new houseguest. But when the magician lands in the hospital and his scheming nephew puts the mansion up for sale, our young hero and his new friends join forces to save their magical home. Filled with laughter and adventure, Thunder and the House of Magic is a wonderful tale that you and your little ones will love. This family movie is directed by renowned 3D filmmakers Ben Stassen (Fly Me to the Moon, Sammy’s Adventures: Escape from Paradise) and Jeremie Degruson (A Turtle’s Tale: Sammy’s Adventure), with original music by Ramin Djawadi (Game of Thrones). The film also features music by Selena Gomez. I’m excited to be able to share an exclusive clip with all of you! It features the newest member of the Magic family. Check it out below! my grandson is going to LOVE this movie!